Zartwerks Studio - Vaclav Zastera Sr.
Vaz Zastera, with his family and friends, are saddenned by the passing of Vaclav Zastera Sr. on December 24th 2012. Vaclav Sr. passed away peacfully at 82, surrounded by his family. A passionate architect, engineer, artist, and musician, he will be deeply missed by his loving wife of 53 years, and by his family in Canada and in the Czech Republic. Vaclav Zastera (1930-2012) left Czechoslovakia just ahead of the Russian occupation, and brought his family, and his art, to a new life in Canada. In his new homeland, Vaclav practiced architecture and explored his art with vigour. Vaclav began his artistic career in Czechoslovakia by painting reflections of his environment, such as romantic medieval vistas of castles and towns. Later, cubism and abstraction captured his imagination. He was influenced by Czech cubist painters such as Bohumil Kubista (1884-1918). 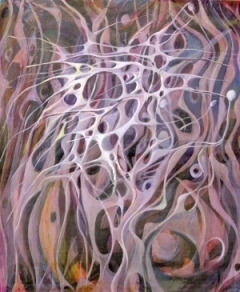 In the experimental stages of his painting career, Vaclav collaborated with Kubista's younger brother, who helped to influence his style in painting. He tapped the well of his own dreams for inspiration, and his work reflected these phantasmagoric visions. 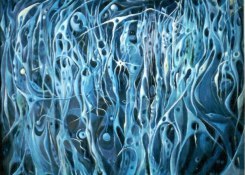 His visionary and abstract paintings challenged interpretation, reflecting both conscious and subconscious thoughts and dreams. The images resembled nothing that exists in this world, but they evoked hauntingly familiar images in the mind of the viewer. All of Vaclav Zastera's original paintings and sculptures reside in private collections in Canada and the Czech Republic. However, permissions have been secured by Zartwerks Studio to reproduce these remarkable paintings as limited edition prints. These reproductions are executed on acid-free William Turner watercolour paper using the giclée technique. This process ensures an attractive and enduring reproduction of Vaclav's work, true to the original colours and design.